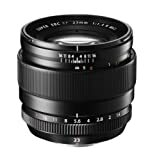 The FUJINON XF23mm F1.4 R has a focal length equivalent of a 35mm lens, and is ideal for a wide range of applications including portraits and landscapes, as well as everyday photography. The fast maximum aperture of F/1.4 allows users to shoot hand-held in low light conditions and achieve sharp images, while also delivering beautiful bokeh for artistic images. Koolehaoda Camera Tripod Ball Head 360 Degree Fluid Rotation Ballhead with Quick Release Plate for Tripod SLR Camera. Max Load: 15kg .